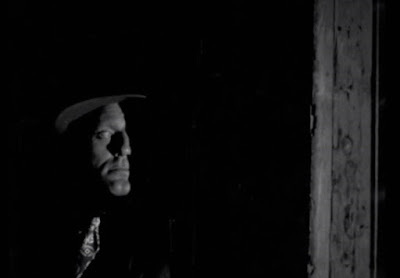 This is the most beautiful film noir ever made. John Alton changed the way films in America looked, eschewing overly bright, presentational lighting for an aesthetic that was darker and more realistic. On the commentary track, author Alan K. Rode tells the story of John Alton’s first order to his crew whenever they worked in a new studio. Alton would point to the myriad lights that had been carefully and painstakingly hung from the ceiling and instruct his men to “take those all down.” Alton preferred smaller lighting instruments on stands. These could be moved and adjusted much more quickly, and one of the reasons Alton became so sought after in Hollywood is that he worked so damn fast. 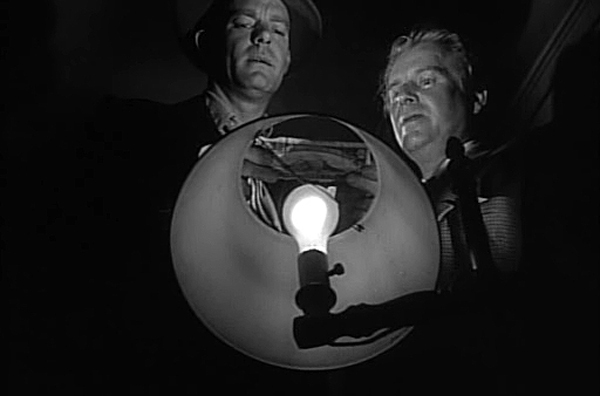 In contrast to the beautiful cinematography, the brutality in T-Men is shocking, especially for a film released in 1947, and the Breen Office demanded that some of it be toned down. Just as Stephen Sondheim wrote some of his most beautiful songs for the repulsive narrative of Sweeny Todd: The Demon Butcher of Fleet Street, the lush black and white cinematography in T-Men draws the viewer into the grit and crime and awfulness of a very noir-y noir. The combination makes it difficult to turn away. The film’s most famous sequence involves “death by steam bath” and stands as a grisly masterpiece of concept, suggestion, staging, editing… and parboiling. I will never again eat a lobster without thinking of this film. The Plot In Brief: Treasury agents Dennis O’Brien (Dennis O’Keefe) and Tony Genero (Alfred Ryder) vow to break a Los Angeles counterfeiting ring by going undercover as mobsters. They assume new identities as Vannie Harrigan and Tony Galvani, respectively. They seek employment with a minor gangster running a counterfeit liquor tax stamp scam, claiming to be members of Detroit’s famous river gang. They begin by tailing “The Schemer” (Wallace Ford) and then work their way up the criminal ladder in order to get to the big cheese of L.A. counterfeiters. Because T-Men was loosely based on real federal counterfeiting cases and because its preface and narration owe so much to documentary, audiences believed they were watching the truth. I was unfamiliar with the entire leading cast, which actually made it easier to believe what I was seeing and lose myself in the story. Occasionally, a bit player would show up that I recognized, but that was just window dressing on a very realistic narrative that really pulled me in. The performances here merit a mention. I was originally cool to Dennis O’Keefe in the lead, but his performance grew on me and I finished the film impressed. He is the glue the narrative needs to hold the story together. 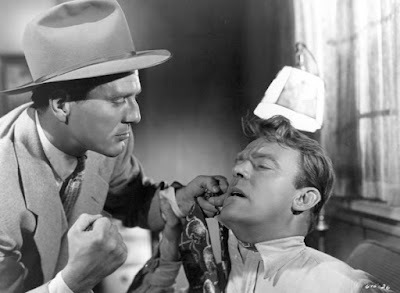 Recalling the film later, I counted how many times O’Keefe is roughed up and beaten in this film; it’s impressive. He is like Indiana Jones, always up for another round—or, to borrow a slogan from a previous generation, a Timex watch: O’Keefe takes a lickin’ and keeps on tickin’. 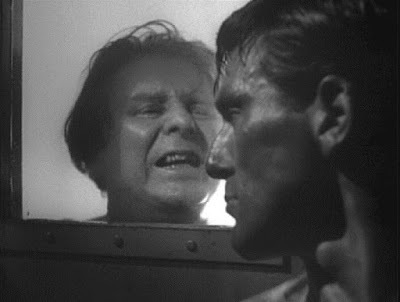 Perennial supporting player Charles McGraw also deserves kudos for playing Moxie, a cruel, cruel man who delights in his cruelty. In scene after scene, Moxie seems to relish what he is asked to by his criminal bosses and often lingers after the fact, smirking with a chilling self-satisfaction. SPOILER ALERT: His character is so awful that in the audio commentary, Alan K. Rode (McGraw’s biographer) mirrors what a lot of us are thinking when the McGraw character meets his end: Surely someone so bad and hateful should be dispatched in a more spectacular fashion? Getting shot in the stomach four times is just TOO GOOD for this baddie. 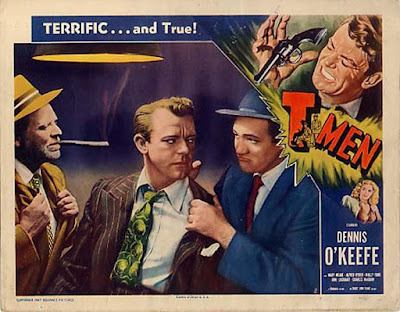 T-Men was a massive hit upon release, buoyed by a great ad campaign, fantastic word of mouth, and a laudatory five-page spread in Life magazine. One of the reasons for its success might lie in the film’s structure, which starts as a dry documentary (real-life Treasury Chief Elmer Lincoln Irey’s introduction is stultifying) then morphs into a standard policier with serious and stentorian narration, but then gradually becomes darker and much more brutal—in short, more of a film noir. This film would make a good “Baby’s First Film Noir” as it leads its audiences from one (safe) genre, through another, and then finally into a (dangerous) third. First someone gets beat up, then we have a torture sequence featuring the bad guys doing something unspeakable off camera, then we are in a Turkish bath wondering how the hell we got there, immersed in the noir’s trademark cynicism and fatalistic despair. This new disc features impressive work by Rode, who provides one of the best and most informative audio commentaries I have heard in some time. One quibble: Rode often mispronounces words in haste (he has a particularly hard time saying “titular,” “chiaroscuro,” and “visceral.”) but this actually becomes charming as the track goes on. Before listening to Rode’s commentary, it had never occurred to me that the Jane Randolph who played Alice Moore, famously terrorized in an indoor pool in Cat People, was the same Jane Randolph who played erstwhile insurance investigator Joan Raymond in Abbott and Costello Meet Frankenstein. Randolph plays a minor baddie in T-Men, and the perpetually annoyed Frank Ferguson makes an appearance here in a bit part as a snotty treasury agent; Ferguson also played... the perpetually annoyed McDougal in Abbott and Costello Meet Frankenstein! This seems to be the inaugural release from a new video label, Classic Flix, which started out as an online disc retailer. Someone at Classic Flix must have a major jones for film noir, and this release of T-Men is a cause for celebration. Some have quibbled at Classic Flix’s pricing, which is a little higher than most catalog Blu-rays, but when you see that what they are presenting is in the same league as Criterion and Arrow titles, I think the extra few dollars are well spent. The transfer is flawless, the extras are thoughtful and well done, and I eagerly await the company’s next batch of titles. Classic Flix is releasing He Walked By Night (co-directed by Mann with cinematography by John Alton) on November 7th and Mann and Alton’s 1948 follow-up to T-Men, Raw Deal, on December 14th. Both releases will feature audio commentaries and additional featurettes. Classic Flix seems to be wishing us all a Merry Film-mass and a Happy Noir Year. Nice read! I've owned this on the "Gangsters, Guns, and Floozies" DVD collection (LOL) from Amazon for a while now but never watched it. I correct that this week! Never heard of this but I'm all over it now, the documentary angle sounds fascinating, do you know of any other earlier film to take the same tack? 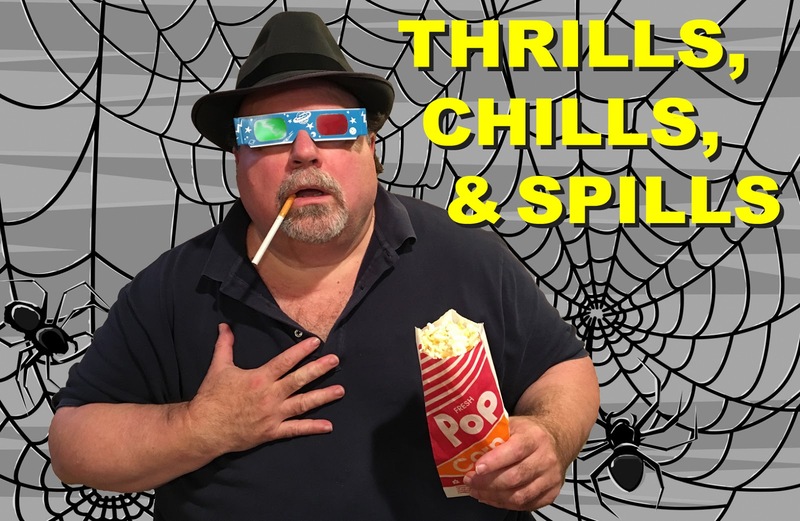 Also, just curious for comparison but how would you thrill chill and spill rate something like Night And The City? If you don't want to that's cool too. Thanks! Oh lord, I haven’t seen Night and the City in a dog’s age. I know for “spills,” it’s hard to beat that fight between Mike Mazurki and Stanislaus Zbyszko! Heck yeah it is! 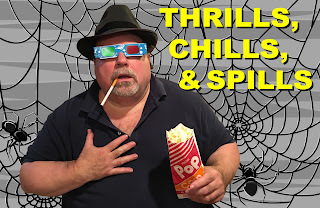 Honestly the thrills and chills might be kind of low, but the sense of doom is 1,000,000%.